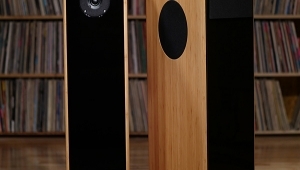 In his previous designs, Dave Wilson has shown an uncompromising approach to enclosures and their acoustic signatures. In the case of the WATT, itself a landmark in low coloration, a cast, mineral-impregnated resin material was used. Many panel materials were researched for the X-1's bass cabinet, including everything you might have thought or heard of, and then some. Wilson especially sought to avoid the characteristic, if not necessarily unmusical, sonic signature of wood and wood-composite materials. 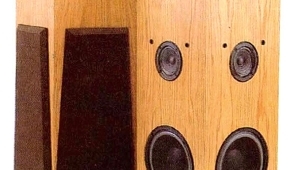 That overlay of "panel sound" common to the construction of nearly all box loudspeakers was considered to act as a barrier to both the bass articulation and to the ability of a speaker to clearly differentiate types of bass instruments. 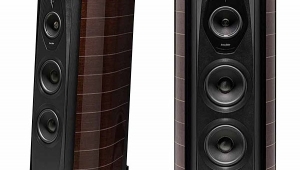 In the Sonus Faber Guarneri, for example, curved, laminated wood surfaces are deliberately exploited to impart a more natural sound to the system. Impulse analysis led to trials with a proprietary phenolic material—a very hard, very high-density laminated polymer long used in the electrical power industry because of its strength, fine electrical properties, and dimensional stability. Figs.A and B (supplied by Wilson) show the difference in cumulative spectral-decay behavior between the ubiquitous MDF and Wilson's high-density composite used in the X-1. This material is generously cross-braced in the X-1's 140-liter (5ft3) bass enclosure to an almost matrix-like complexity. The result feels almost solid, like a block of stone. Bass-reflex tuning is provided by a huge ducted port, 6" in diameter by 17" long, made from machined alloy and bolted into the center of the rear panel. (This port's 8.5-liter volume of moving air is greater than that enclosed by many sealed-box miniature speakers!) Bass-reflex ports are characterized by terms such as "volume velocity," whose magnitude describes how much acoustic output can be delivered over what frequency range for a given distortion criterion. Even when tuned to a demandingly low 24Hz, as in the X-1, where the useful output covers a range of about three-quarters of an octave (18-30Hz), this size of port is capable of producing room-shaking acoustic bass power without significant distortion. It may use seven drive-units, but the X-1 is a four-way system. 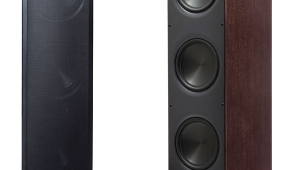 The first crossover is set at a low 120Hz, but as it's electrically first-order, 6dB/octave, there will be considerable overlap between the outputs of the bass and midrange drivers. 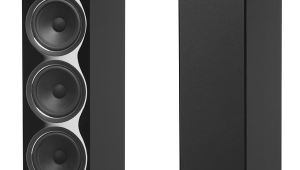 Significant output from the woofers will be present up to 500Hz, this intended to reinforce the lower midrange and to help drive the system toward maximum conversion efficiency. Likewise, the "reach" of the high-power midrange drivers down into the upper bass improves the low-frequency "speed" and overall transient performance, helping to define the leading edges of notes. 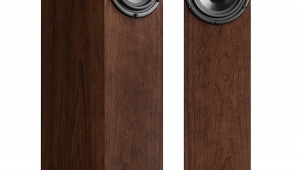 It also blends the transition between the different acoustic heights of the bass and mid sections. 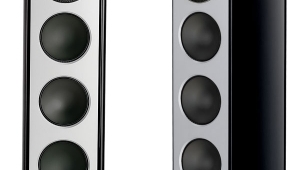 This increase of the effective vertical length of the overall low-frequency source tends to reduce the depth of the reflected floor-notch effects by spreading them over a wider frequency range. Such a low-order crossover is made possible thanks to the use of two 7"-cone midrange drivers—high-power bass-midrange units that would be capable of full-range performance in a smaller system. Sealed in their own enclosures, the midrange drivers will also have a natural second-order acoustic rolloff below 70Hz or so to give an ultimate 18dB/octave rolloff slope. As a consequence, they're not called on to deliver any musical information of significance below 40Hz. These units cover a nominal 4½ octaves up to the second crossover at 3kHz, where both high- and low-pass transitions are second-order, 12dB/octave. This doesn't appear to make immediate sense for a vertical midrange/treble array that has the tweeter located between the two midrange units. However, the Grand SLAMM's facility for fore and aft displacement of these three modules—lower and upper mids and treble—may be independently varied, and their acoustic delays adjusted for near-perfect phase integration through the crossover region. 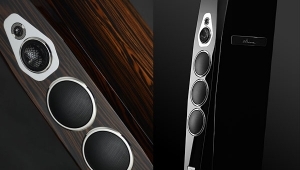 Such is the glorious freedom this unfettered high-end speaker design allows! 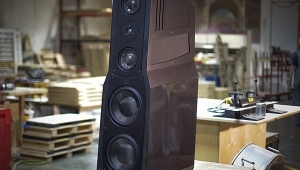 The front tweeter operates full-range to its limit beyond 20kHz, while the third crossover point at 12kHz (damped second-order) feeds to the fourth "way" of this four-way speaker system. This is a pair of rear-facing "ambience" tweeters that are run some 10dB or so below the main level. A front-facing tweeter of the usual 1" type becomes increasingly directional above 10kHz due to its small size, this dimension approaching the actual wavelength of the frequencies reproduced. Additional smaller tweeters could be fitted adjacent to the main tweeter, but it's hard to blend their acoustic output; the result often mars the main signal. 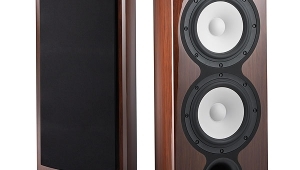 Ideally, a touch of extra treble energy is required to drive the room acoustic in the upper range where the energy output of the main tweeter is beginning to fall. 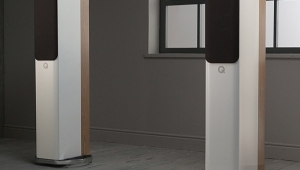 Bi-directional panel speakers naturally have this "open" quality: rear-directed treble energy helps "open" the excitation of the room acoustic in the uppermost part of the frequency range. Many designers of box speakers have recognized this loss and tried various solutions—eg, the Shahinian designs, the Mirage bi-directional models, the top-mounted second tweeter of the Linn Isobarik, and almost all the Snell range. Wilson's ambience tweeters are mounted on rear-angled facets of the uppermost X-1 enclosure module. They nicely dispense a proportion of delayed, reverberant air and sparkle without any apparent loss of focus or wavefront accuracy from the main tweeter. 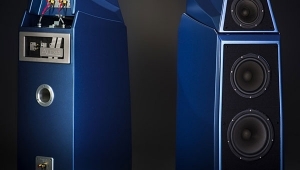 Drive-Units: Both woofers are made by the French company Focal specifically for the Grand SLAMM. (If sold on the consumer market, these units alone would cost upward of $1000/pair.) They both feature a diecast chassis and have the same type of very large magnet and motor system. The high-power motor coils (2kW short-term) are wound on 3"-diameter Kapton formers—Kapton withstands very high working temperatures—and are ventilated to improve long-term thermal dissipation. 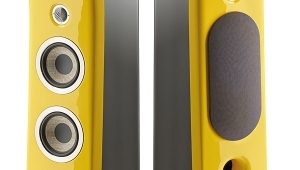 The woofers use a distinctive composite, ventilated-magnet design. The pole pieces are chromed, while the high-intensity magnetic flux required for the target sensitivity is achieved by using an array of smaller ferrite magnet rings, their red-painted finish lending them a distinctive appearance.